So you're on the train and wanting to watch a film on your tablet. Its some time after midnight, you've had a busy day in meetings about numbers and pie charts, and all you want to do is relax, get home as quickly as possible and watch Finding Nemo. But damn, you can't get comfortable. Unlike a laptop, a tablet screen needs constant support and your hands are far too tired to hold anything long enough and still enough for your exhausted brain to make sense of animated wise-cracking fish. But then you remember that you have already read this review and went straight out to purchase the Breffo range of mobile accessories. Phew. Here at t'Pit, we've endured similar versions of the above First-World Problem, namely keeping our mobile tech upright when we need to go hands-free. Thats why we were chuffed to cheese to receive three of the latest from British design company Breffo: The Spiderpodium, The Spiderpodium Tablet and the Earphone Tidy. Yay for being sent stuff! 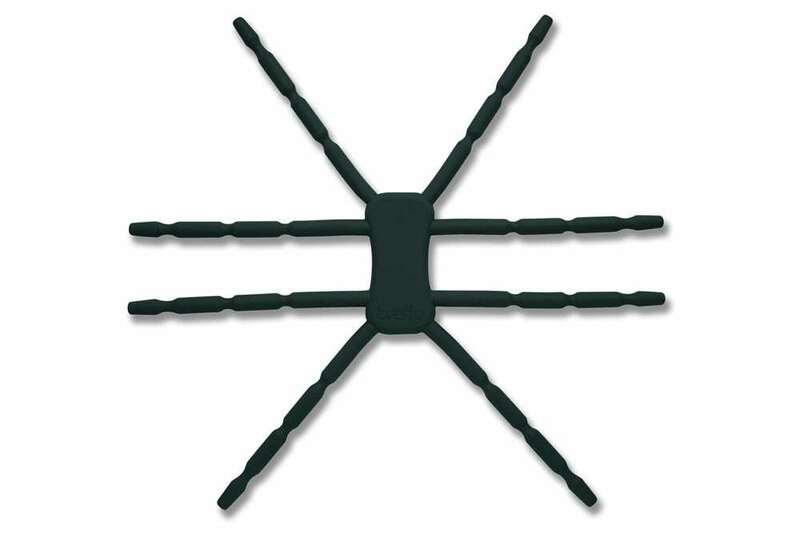 The Spiderpodium and The Spiderpodium Tablet are essentially the same thing – the tablet version being much larger. 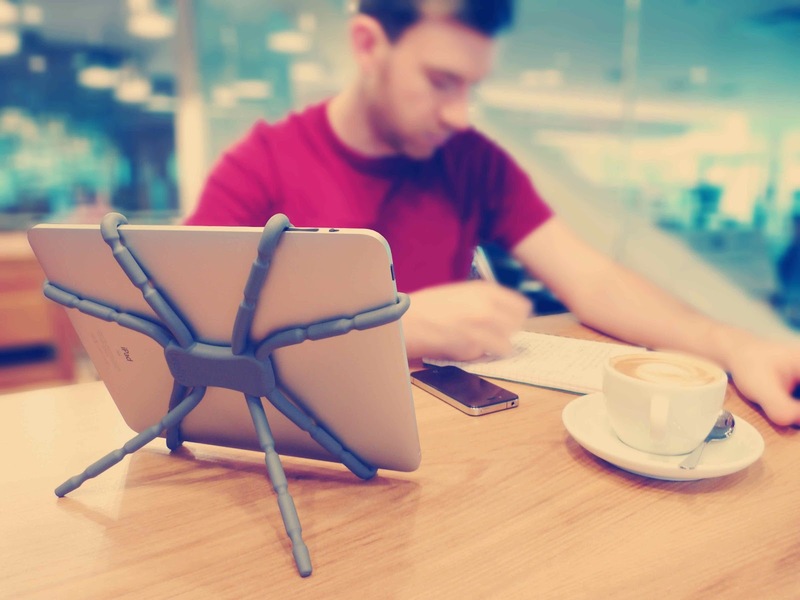 With a striking resemblance to an alien arachnid, the clever piece of kit has eight bendable and posable legs which can wrap around your phone, tablet and camera to support them wherever you need them to stand. As there are so many 'legs' one can create a massive amount of combinations of wraps and stands to suit almost any situation. Need a tripod for your camera? Its sorted. Need to keep your iPad upright as you read recipes? Done. The Spiderpodium can also be used to hangs other less techie things as well, such as lanterns while out camping. There are a multitude of uses for this thing! Armed with both sizes of the Spiderpodium, we set to some tasks which needed our hands to be busy, while also requiring access to a screen. How about using the maps and GPS on our phone while out cycling? 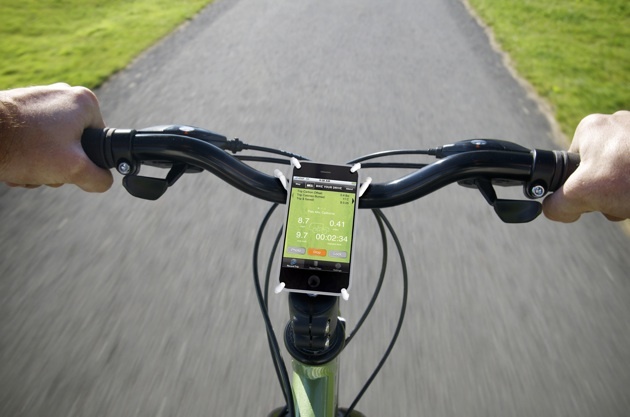 We found that the smaller Spiderpodium held our mobiles comfortably and securely, while also gripping the handle bars of the bike excellently. No amount of bumps and lumps in the road could convince the thing to slip free (not even when we hit a dead fox). The Spiderpodium Tablet was given an outing in the car, being employed to hold up the afore mentioned iPad while the wee kiddies in the back seat watched a film. 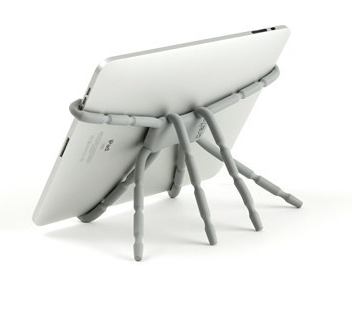 The longer legs of the Tablet version are ideal for gripping larger gadgets, with four legs used to wrap around the corners of the screen, while the other four tangled around the passenger seat headrest support. Apart from the gentle sway while the car was in motion, the iPad was stuck firm, leaving us to concentrate on the road (and not on worrying if our beloved tablet was about to fall to the foot-well and shatter). Breffo also produce a fine Earphone Tidy, which is essentially a lump of the same pleasingly soft and tactile rubber fromwhich the Spiderpodium are made. As useful little things go, this is great, and actually did manage to keep the headphones tightly bundled up, avoiding tangles. It certainly isn't the prettiest cable tidy out there, or the most interesting to look at, but it's functional and well moulded – like its bigger spider brothers. 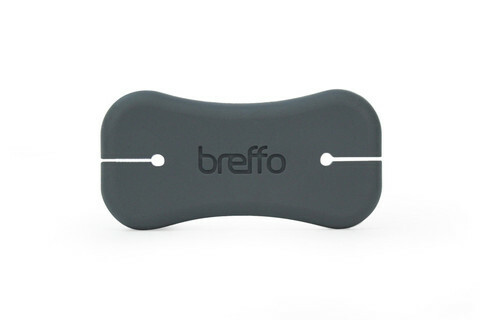 All in all, the Breffo range of mobile accessories is one we welcome – a great blend of functionality and innovation which is, fortunately, available in a range of colours. Subscribe to our weekly newsletter. It's cool.